Capital Budgeting is the process of analyzing a company's investment decisions such as investing in new equipments, machineries, plants, projects and products. This process involves the estimation of the expected cash flows, the calculation of the Net Present Value (NPV) and the calculation of the Internal Rate of Return (IRR) of the investment. Net Present Value is defined as the present value of all cash inflows minus the present value of all cash outflows. If NPV is positive, the investment is making money and is thus viable. Internal Rate of Return is defined as the discount rate that makes the Net Present Value zero. If the IRR is greater than the opportunity cost of capital then the investment is feasible. The greater the value the IRR, the more feasible an investment is. There are two hurdles in this analyzing process. 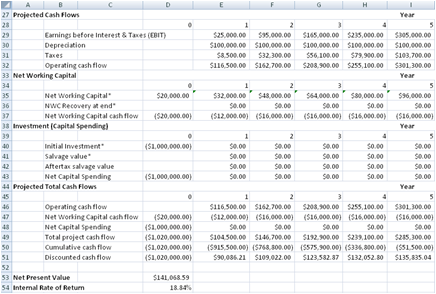 One involves the correct estimation of the expected cash flow. The other is the use of a correct discount rate (also known as the Project Cost of Capital). In some cases, it is possible to simply use the Company' Weighted Average Cost of Capital (WACC) as the Project Cost of Capital. This is especially the case if the project has similar cost structure as the company. In other cases, a separate estimation or assumption of the Project Cost of Capital is required. This Capital Budgeting spreadsheet aims to assist investors, managers or analysts in correctly estimating the cash flow in different scenarios and accurately calculating the Net Present Value and Internal Rate of Return. It also allows different investment projects cash flow to be compared and the forecasting of base case, worst case and best case scenario. The CapitalBudgeting-ProjectCashFlow-NPV worksheet in the Capital Budgeting spreadsheet allows you to key in the assumptions and estimates of a project cash flow and will calculate the Net Present Value and Internal Rate of Return of the investment. This worksheet performs capital budgeting analysis by making three basic assumptions. The assumptions are the Discount Rate to use in the investment project, the company's Tax Rate and the estimated percentage of Net Working Capital over Sales. The project investment and salvage value are taken into account in this section. Net Present Value is calculated using Excel's NPV function on the Total project cash flow. Internal Rate of Return is calculated using Excel's IRR function on the Total project cash flow.